Something I wrote in April and never published. God knows why. 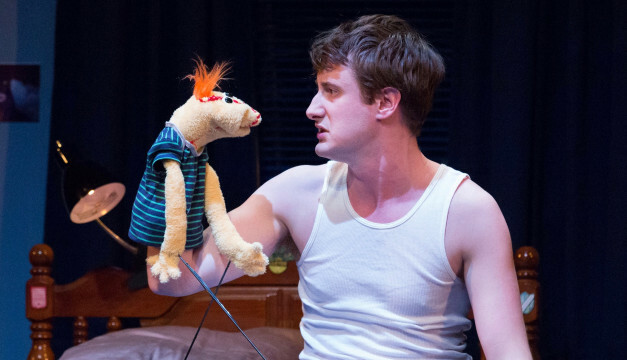 HAND TO GOD — Philadelphia Theatre Company at the Suzanne Roberts Theatre, Broad and Lombard Streets, Philadelphia, through April 30 — Robert Askins’s play is puerile one-trick pony that knows no inhibitions and goes for several throats…and ears. As literature, it’s shallow, showy, and worst of all, borderline sanctimonious. As a script for actors to play to the hilt, as Matt Pfeiffer’s cast does for the Philadelphia Theatre Company, it’s a rollicking gem that shoots for and achieves bellylaugh comedy through sharp, naughty wisecracks, breezily hot sexuality, and a puppet that alternately earns hearty yuks and gets on your nerves. The best way to enjoy this piece is to abandon notions of deeper — or any — meaning, avoid offense at language and tongues, those talked in and those licking various characters, and let Askins’s wickedly impish humor and Grace Gonglewski and company’s sterling performances wash over you. Pfeiffer’s production is perfect for this material, It’s cartoony while maintaining full sense of character and as much sense of reality as Askins with allow. Everything is crisp and on the mark. Pacing is topnotch, and to a person, the cast nails every line, every joke, and every physical demand. Gonglewski is a picture of desired propriety giving in to gratifyingly comfortable looseness. She and William Zielinski are like the Harper Valley PTA en masse, trying to look upstanding while being so guilty and enjoying their trespasses so much. Alex Keiper is smart and real in the play’s most thankless role, the child that can go beyond moral bounds because she knows they’re twaddle but transgresses reasonably and is able to behave with decorum. That wonder of acting craft, Matteo Scammell, shows once again there ain’t no chains on he as he displays all the hormonal insistence and Neanderthal ways of the bad, bawdy kid in town everyone knows is destined for prison but wants to have some carnal dalliance with before he goes. 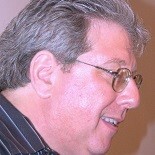 Speaking of wonders, Aubie Merrylees unleashes a where-did-that-come-from tour de force that elevates him from a fairly uninteresting new face on the horizon to a complete and multiple performer who excels in comedy, comic voices, movement, sound accompanying copulation, and puppet manipulation. (The way he works his puppet’s mouth as it is about to ejaculate is masterful.) Gonglewski and Scammell provide fireworks, but Merrylees supplies the tingle, outrageousness, and versatility that make “Hand to God” a success. PTC is offering a great entertainment. Except for those who want the theater to be Sunday school, and they can go tickle their navels. Askins’s concept is not new. Gonglewski’s recently widowed neurotic tries to bounce back from an emotional meltdown by conducting a class in puppetry at a local church. Her students — Keiper, Scammell, and Merrylees — do the usual silly things teens do with sock puppets, but Merrylees’s creation appears to take on a life of its own, saying the things is seems Jason, Merrylees’s character, cannot say, exposing information, surmises, and accusations that make the others think Jason, or his puppet, is possessed by the devil and in need of exorcism. The famous Flip Wilson quip, “The devil made me do it,” abounds throughout Askins’s script. The script is facile though Askins can whip up powerful ripostes and one-liners. “Hand to God” is a sketch expanded to a play more than it is a work that goes beyond its jokes and shattering of boundaries. Pfeiffer’s production makes the script exponentially better. It allows “Hand to God” its ability to entertain. Pfeiffer and cast understood what Askins gave them and went to it with no holds barred. The cast, to a person, shows its knowledge and wit. See them both for a good, good time and to see a shrewd and assured ensemble at work. Kudos also to Brian Sidney Bembridge’s poster-strewn set that proves so versatile, Thom Weaver’s marvelous lighting, and Robert Smythe’s artistry and deviltry with puppets. Chung has a way of marrying formality with emotional verity and the genuine basic human love sisters can have for each other, especially when they live an oppressive society in which the slightest perceived indiscretion could burgeon into a fatal infraction. She neatly creates a conversation between a doctor, of course state trained, and the sisters that is full of seemingly required set phrases and rituals. Socialism gets a dig when the doctor says he cannot jeopardize pharmaceutical supplies by giving one of the sisters the full dosage she needs to fight an escalating respiratory problem. The fragility and instability of life in North Korea is illustrated by how easily one can fall from favor or get into unexpected, unwarranted trouble. One sister’s husband, an official in the Kim government, is taken into custody for reasons that are never explained. The same sister’s eight-year-old son gets into a fracas and must voluntarily report for re-education, though the reporting is not necessarily voluntarily and re-education, even if a solid North Korean is not supposed to acknowledge it, consists of Spartan imprisonment and slave labor. Sisters being sisters speak openly. Junhee, the more modern and daring sister, sounds like an American when she says glibly, “I’m not going to re-education” after a sarcastic remark to the doctor raises concern she could be subject to it. Minhee, the ailing sister whose relatively well-to-do household has been emptied by the disappearance of her husband and the incarceration of her son, is more indoctrinated and less inclined to speak of ill of NK policy or the conditions of her loved ones. In addition to her keen conjuring of North Korean life and the attitudes and language that accompanies it, Chung deftly balances the realistic and presentational with fantasy scenes and more elaborately conjectured scenes that illustrate how NK policy can break down a person and how many ways the Kim administration has for torturing people and/or putting them to death. Chung is also a great storyteller. In addition too views of tete-a-tetes between the sisters at Minhee’s allegedly safe dining table, the encounter with the doctor, and elaborate representations of coercion and humiliation, she includes a plot about the sisters escaping from North Korea. This narrative adds great depth and texture to the play. The sisters make two attempts to escape. Each time one of them makes it and the other doesn’t. Sisterly love is shown in both instances. You see Junhee and Minhee, separately, in different American cities, years apart, trying to adapt as Westerners while retaining some notions of the original education and life teachings in their native country. Each is wracked by guilt about being in a free society while her sister is left in NK, but seeing how Chung designs their individual receptions and reactions to American life would be enough play on its own. How lucky to have all elements Chung conceives woven into such a satisfying, telling, and dramatically compelling piece as “You For Me For You” is as a whole. 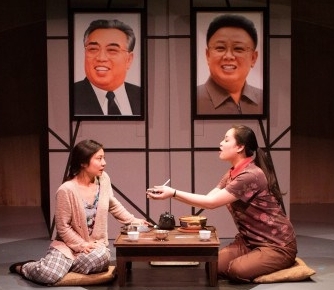 Chung’s vision is beautifully realized in Rick Shiomi’s production for InterAct. The conventional and the fanciful flow in graceful sequence, each being a counterpoint to the other with never a jarring transition to be found. You experience the threats and taunts of the imperial soldiers played by Justin Jain as if he was a battalion, and go through Shiomi’s powerful ballet of escape through perilous terrain with the same level of intensity you feel when Minhee and Junhee are having a critical conversation at home. Bi Jean Ngo is deeply affecting as Minhee, the quieter, more accepting, and more fearful of the sisters. She has lost everything, and she doesn’t want to be apart from Junhee. Whatever her feelings, she must adapt to realistic circumstances, and Ngo is heartbreaking as Minhee thinks about the fates of her husband and son, her illness, Junhee’s plan of escape, not making it out of North Korea the first time, and ultimately going to America alone. Like Shiomi’s production, Ngo seamlessly goes from intricately choreographed or highly physical scenes to quiet thoughtful ones, such as when she talks to Junhee and when she has to cope with a United States so different from anything she knows. Mina Kawahara is like a breath of modernity on the North Korean landscape. She walks and speaks with the motions and tone of a Westerner and has none of the implied obeisance of her sister nor the rigid formality of the doctor. Junhee’s story is just as intense as Minhee’s, but you feel more for Minhee because Kawahara convinces you Junhee can handle anything. It makes it more poignant when you realize there are matters and circumstances beyond her control or ken. Justin Jain is a master of identity shift as he plays a variety of men, all difficult or demanding in their way, with versatile aplomb. Hillary Parker creates humor out of Chung’s way of showing how much trouble Junhee has understanding English and other languages as she makes her way from China, the country to which she escapes — “Keep walking forward, and the Chinese won’t bother you,” says one of her conveyors from North Korea as she crosses North Korea’s border. Parker’s way with verbal gobbledegook is adroit and funny. Dwayne Thomas also scores in multiple roles. Melpomene Katakalos’s set enhances many of the locations and situations in which the sisters find themselves. This entry was posted on September 7, 2017 by nzoren in Theater Reviews and tagged Alex Keiper, Aubie Merrylees, Bi Jean Ngo, Dwayne Thomas, Grace Gonglewski, Hand to God, Hillary Parker, InterAct Theatre, Justin Jain, Matt Pfeiffer, Matteo Scammell, Mia Chung, Mina Kawahara, Philadelphia Theatre Company, Rick Shiomi, Robert Askins, William Zielinski, You For Me For You.